Valencia Group hotels in Texas and California are approaching their fourth year in support of No Shave November. Six properties, including Hotel Valencia Riverwal k in San Antonio, TX, Lone Star Court in Austin, TX,Hotel Sorella CITYCENTRE in Houston, TX, Cavalry Court and The George in College Station, TX, and Hotel Valencia Santana Row in San Jose, CA, will each select managers to throw away their razors for the month in the goal of raising eyes and awareness for cancer prevention. Throughout November, guests can anticipate in a range of pop up activities, and 20% of sales from select food and beverage items will benefit the American Cancer Society. 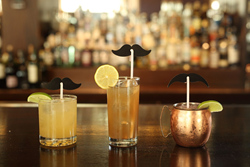 In true Valencia Group style, visitors can expect to see a range of creative and limited availability specialty cocktails such as the Mustache Mule and Manly Margarita adorned with handlebar straws. To join Valencia Group in their efforts to raise money, click here to donate. Stop into Vbar, Dorrego’s, The Canteen, 1791 Whiskey Bar, Monnalisa, and Water Trough to sample each of the three selections or treat yourself to one at home with the following recipes.